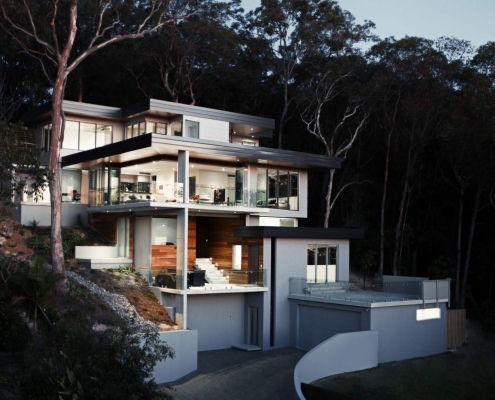 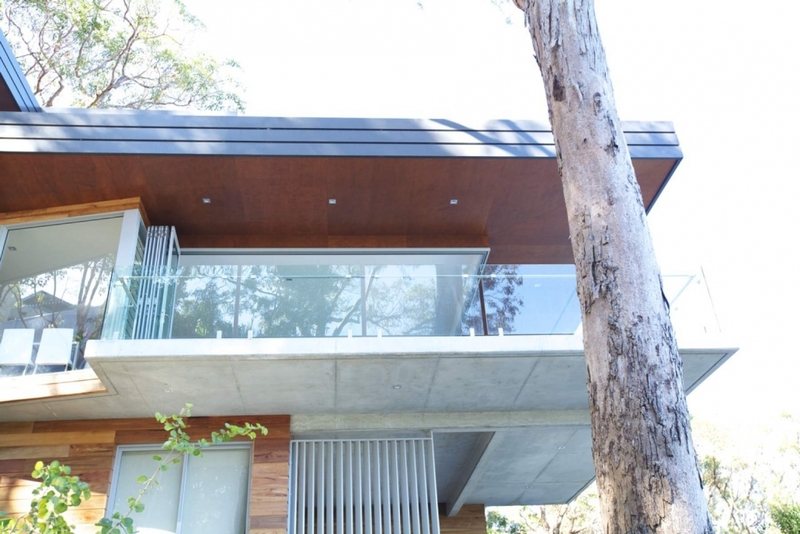 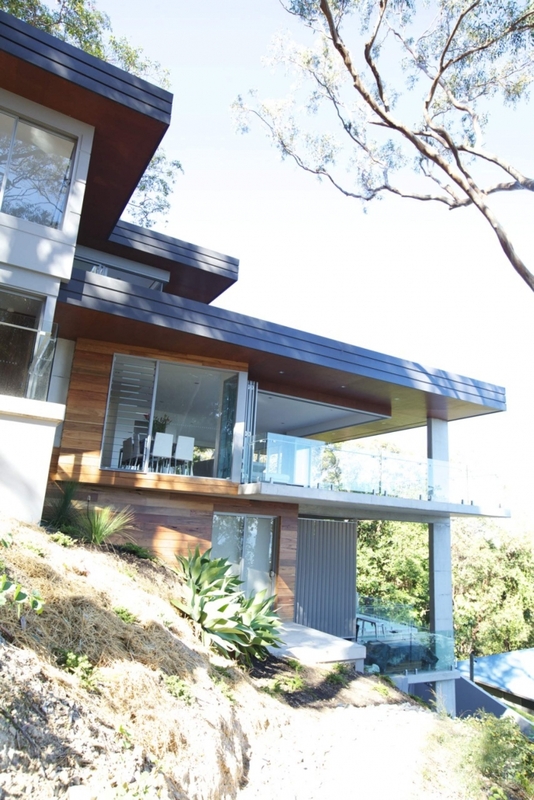 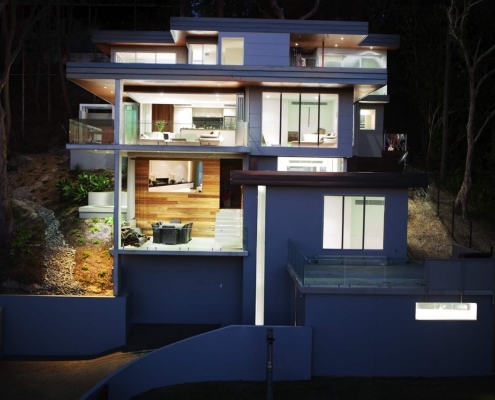 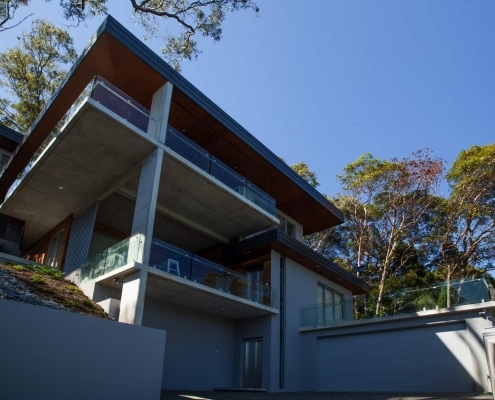 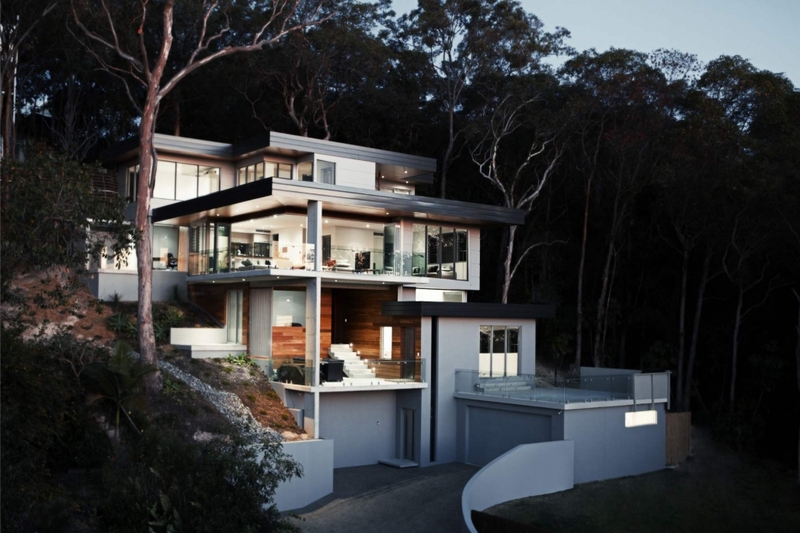 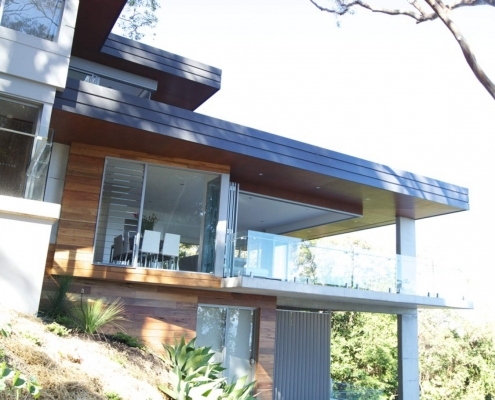 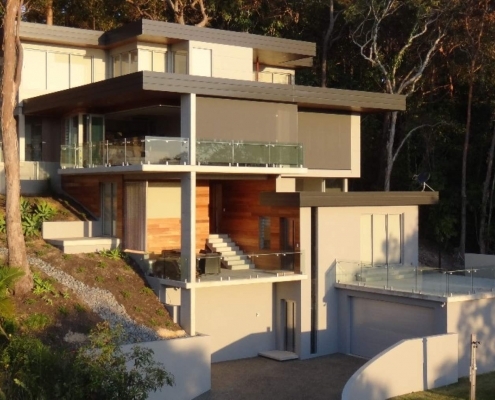 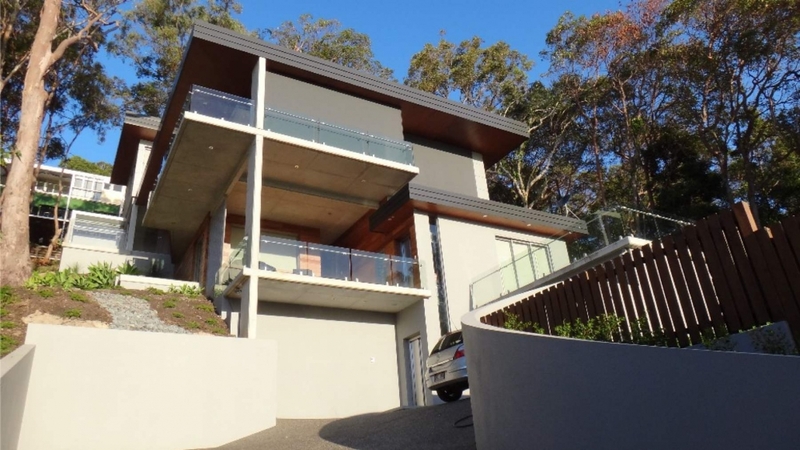 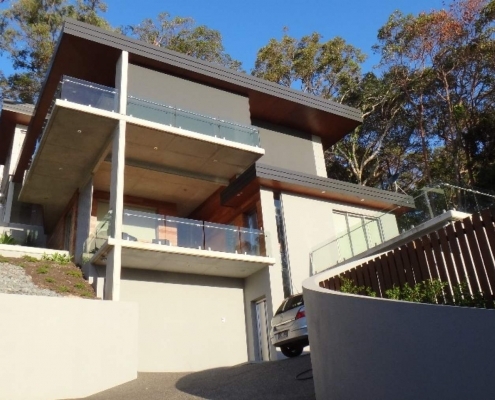 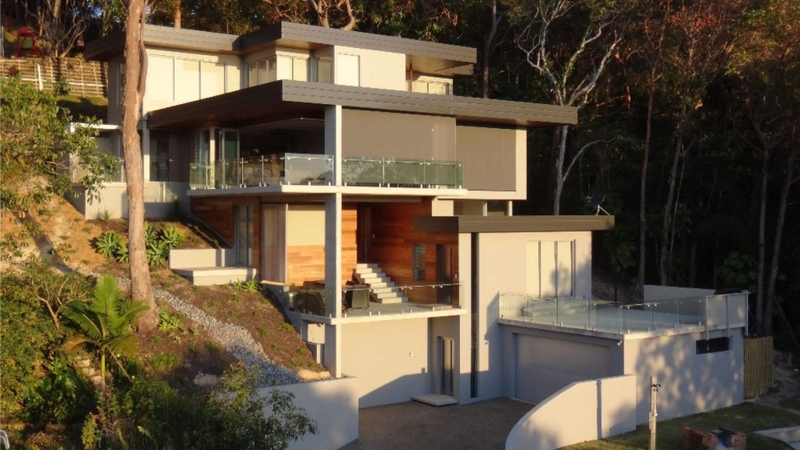 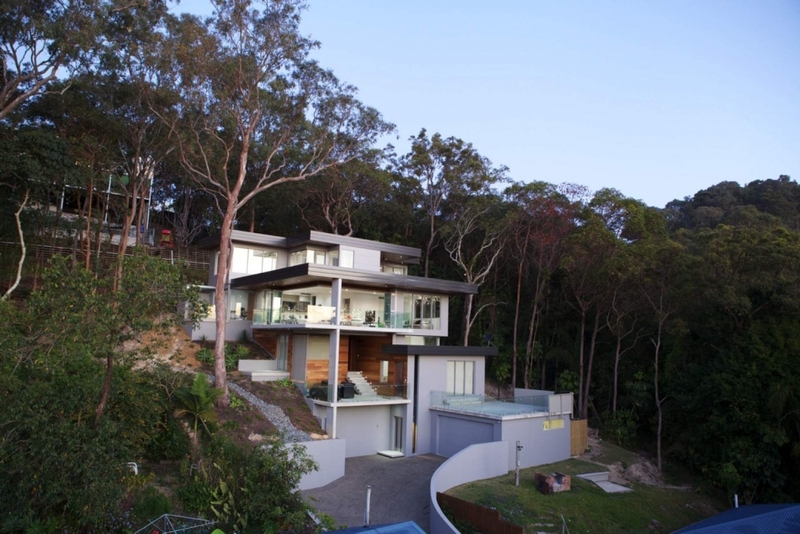 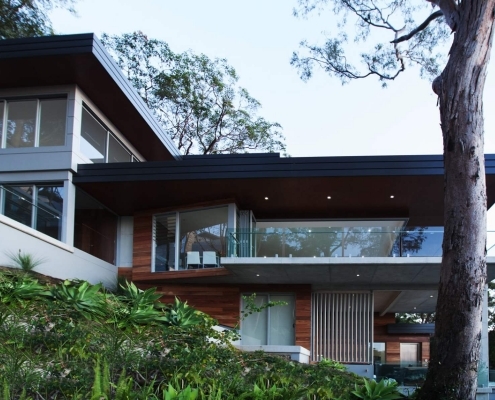 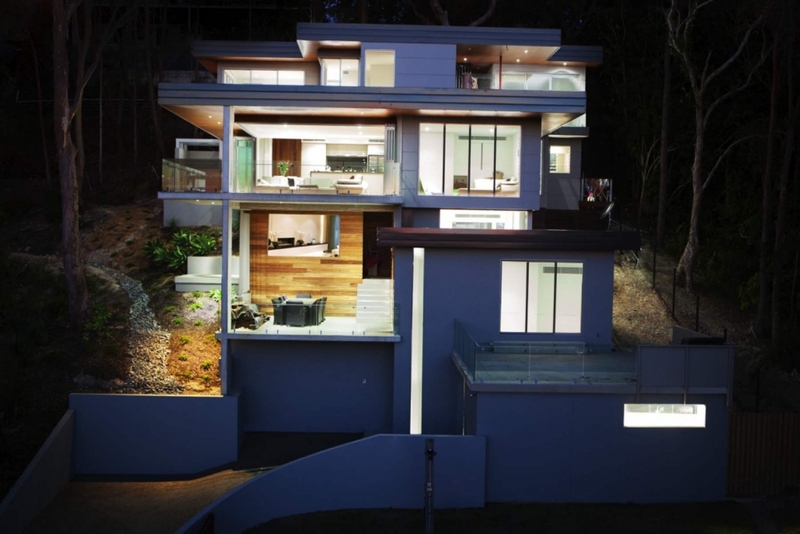 Their was an existing residence at the front part of the block with the land sloping upwards at a steep rate from the street to the rear which was surrounded by bush. 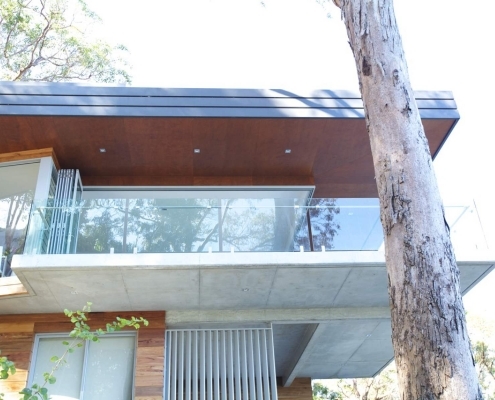 The front home was to be subdivided and sold off to help fund the build of the new rear house. 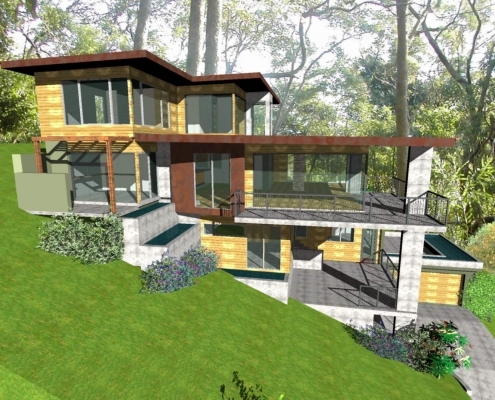 The owner wanted a solid layered design with the inspiration being taken from Frank Lloyd Wright’s famous American design “Falling Water”. 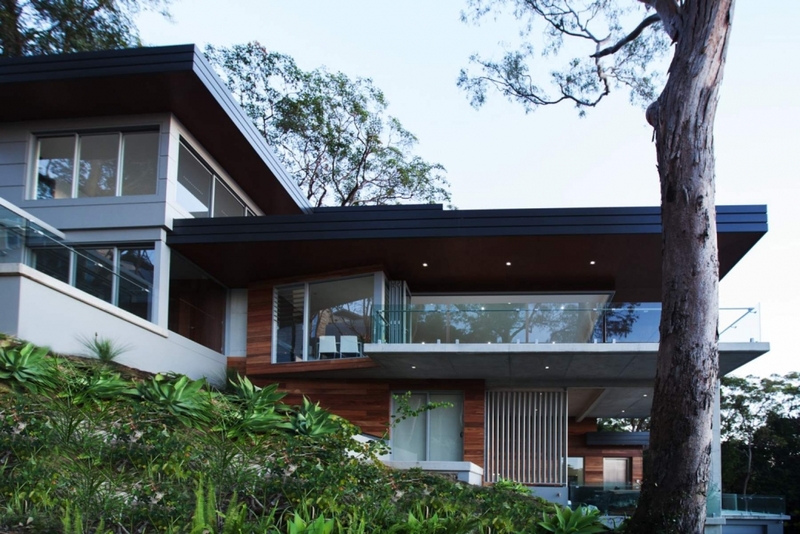 The home needed to be designed for an extended family of their grown up children and partners to stay. 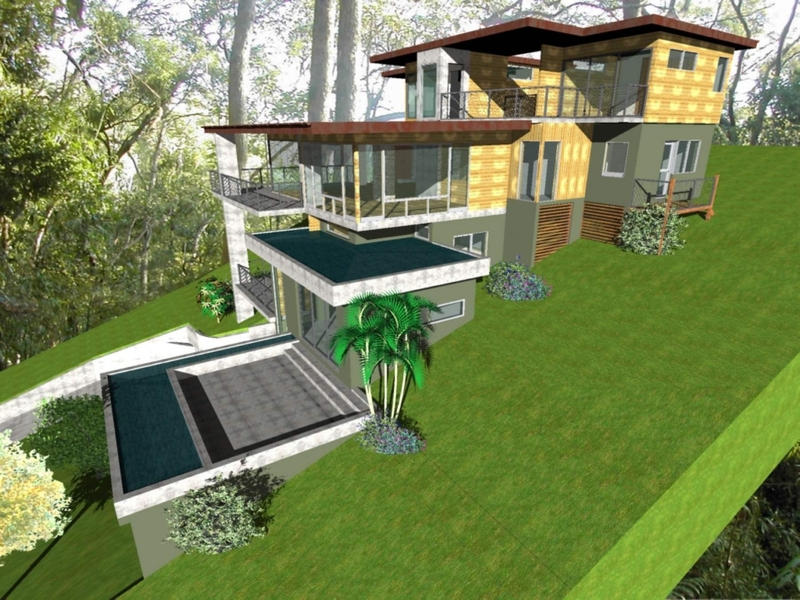 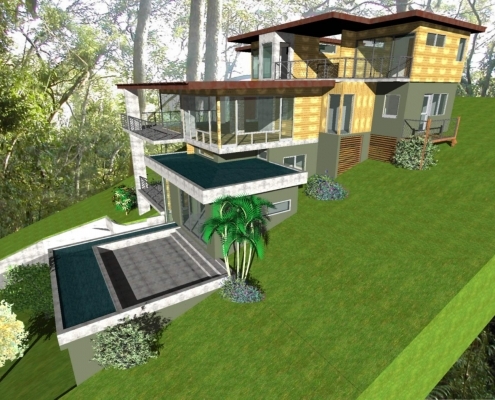 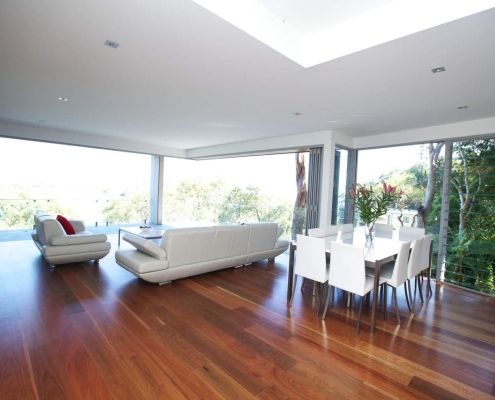 A contemporary style was necessary for maximising the site’s valuation. 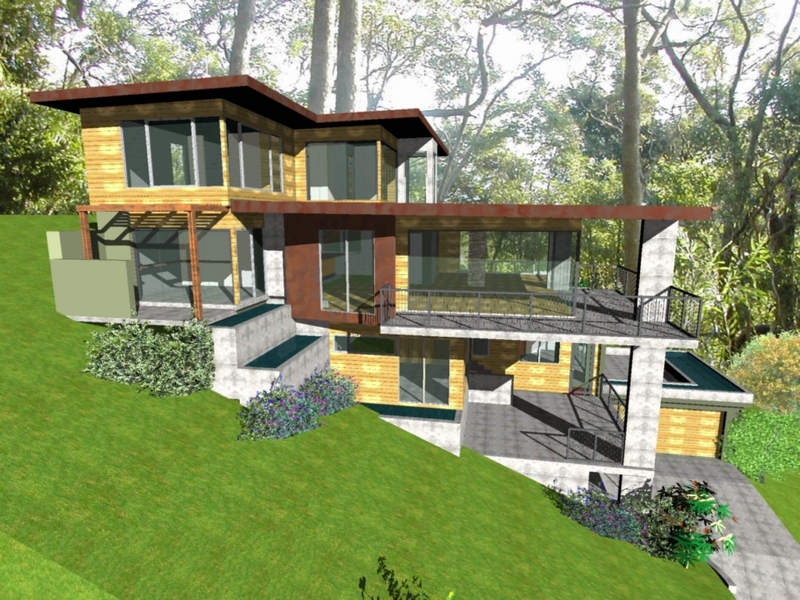 Due to council constraints and by necessity the house needed to step back up the hillside on many levels. 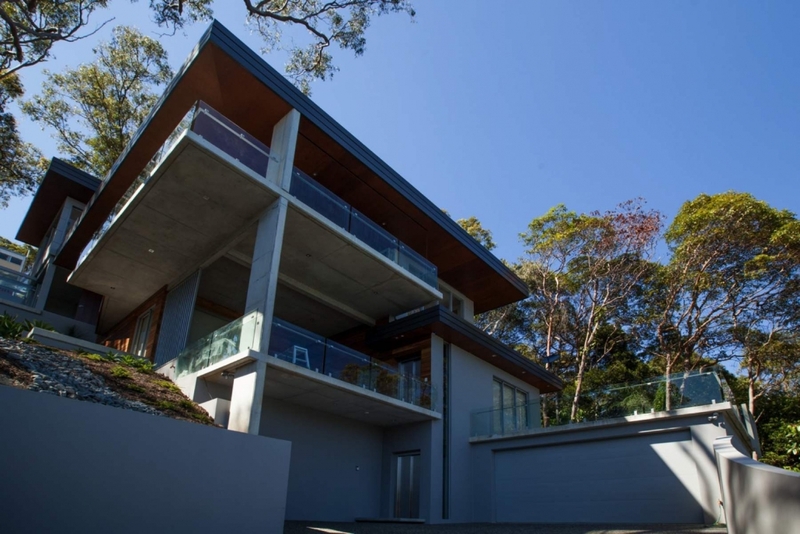 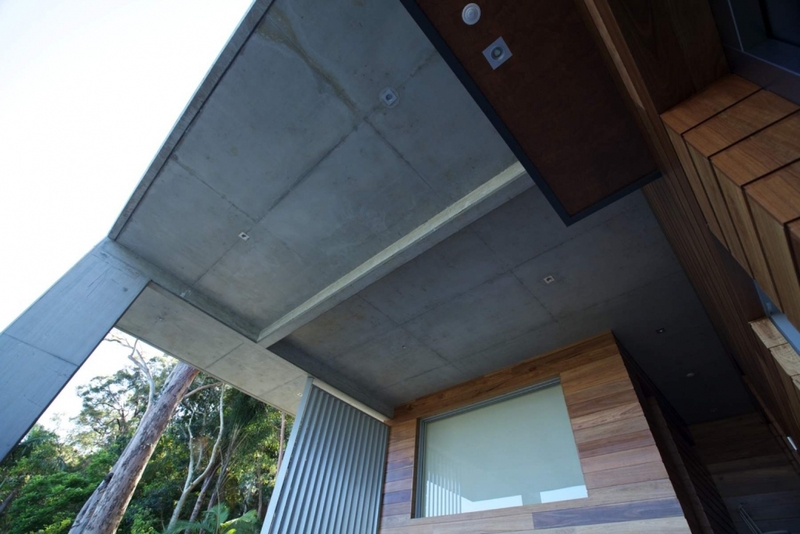 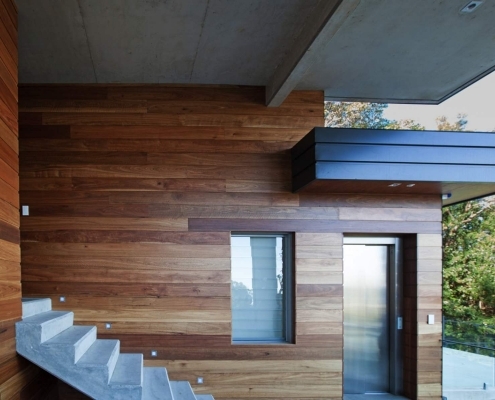 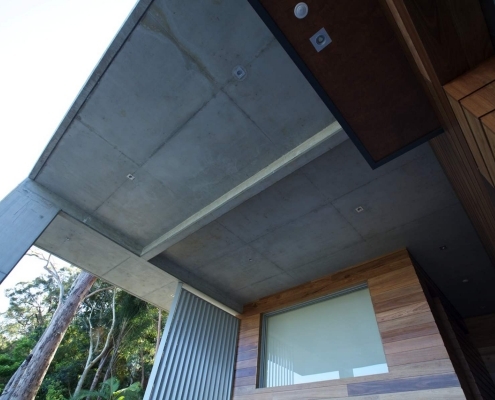 One drives up a steep exposed concrete driveway to a double garage and double entry lift that transports people to the next level up. 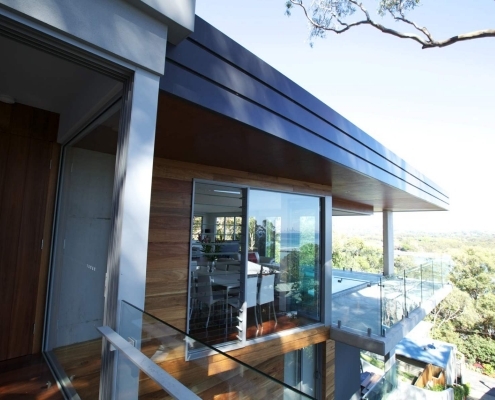 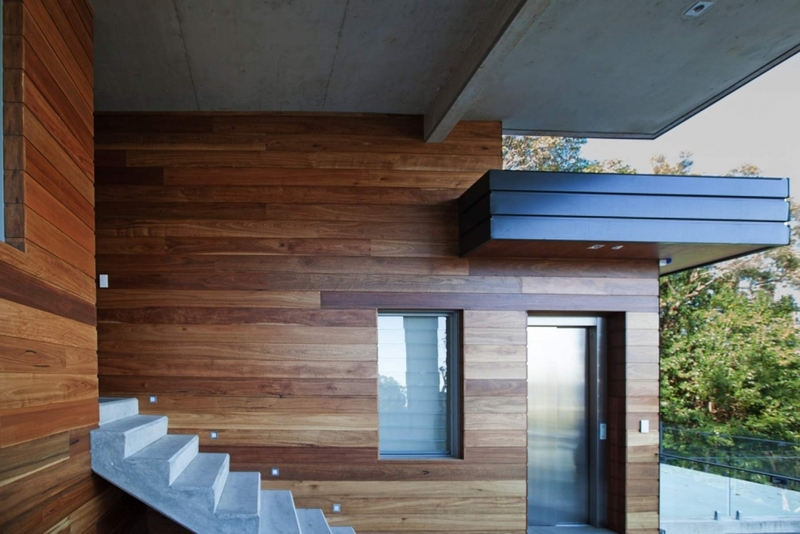 Stepping out onto a double height outdoor entertaining area you then travel via a stair and hallway lined with custom made hardwood chamfer board that offsets the poured insitu concrete finish. 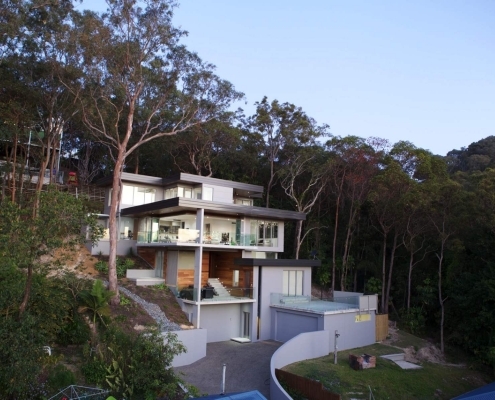 A fully self contained guest suite and patio is on the right and a gym/office is on the left. 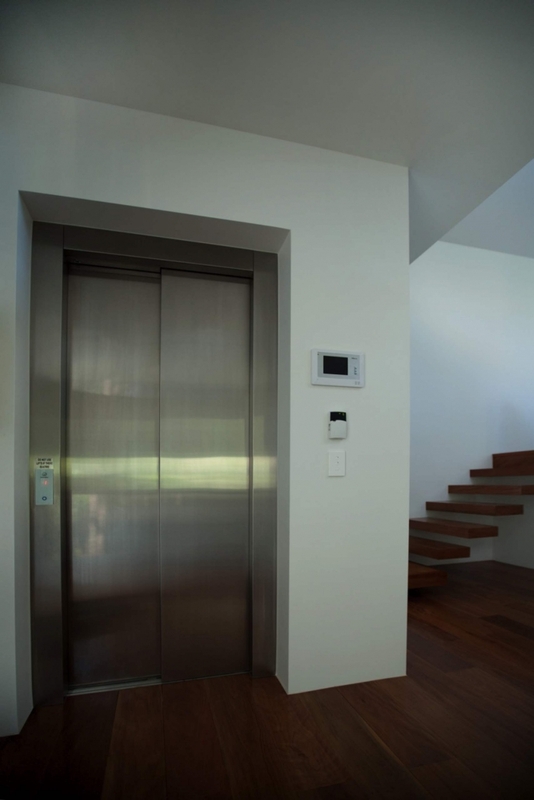 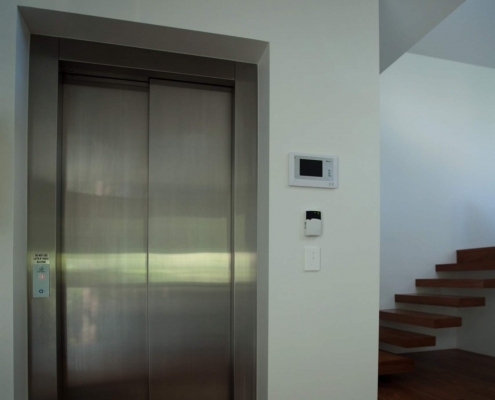 Another lift transports the occupants to the main living areas or up another level to the main bedroom and guest bedroom. 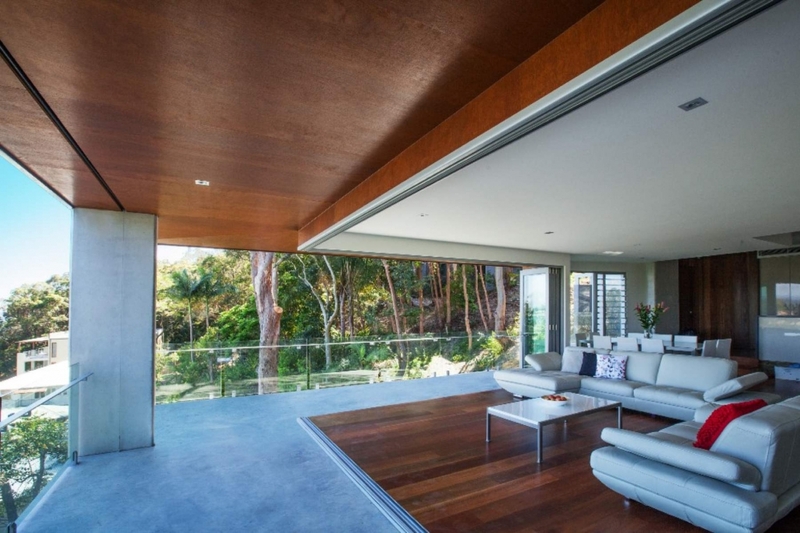 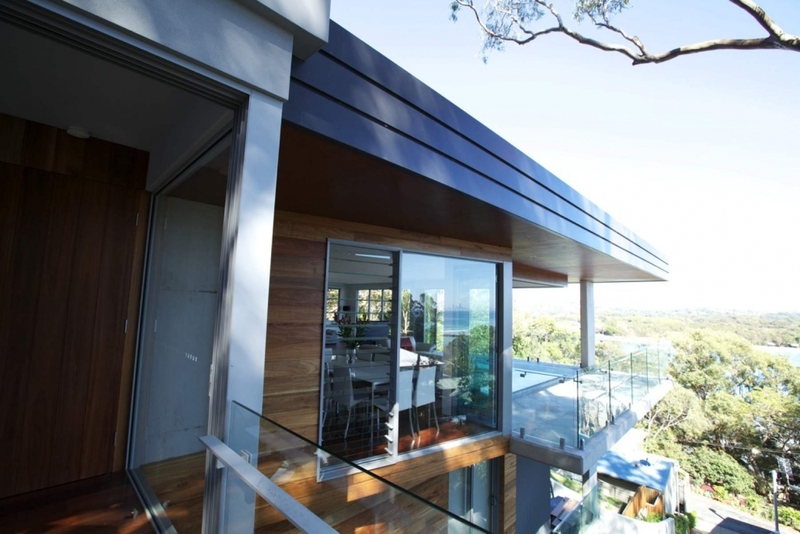 The main living area is unencumbered by walls and features large open living areas, toughened glass stacker doors with no visible structure holding up the roof. 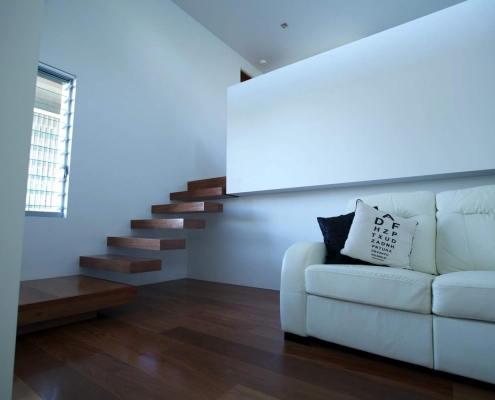 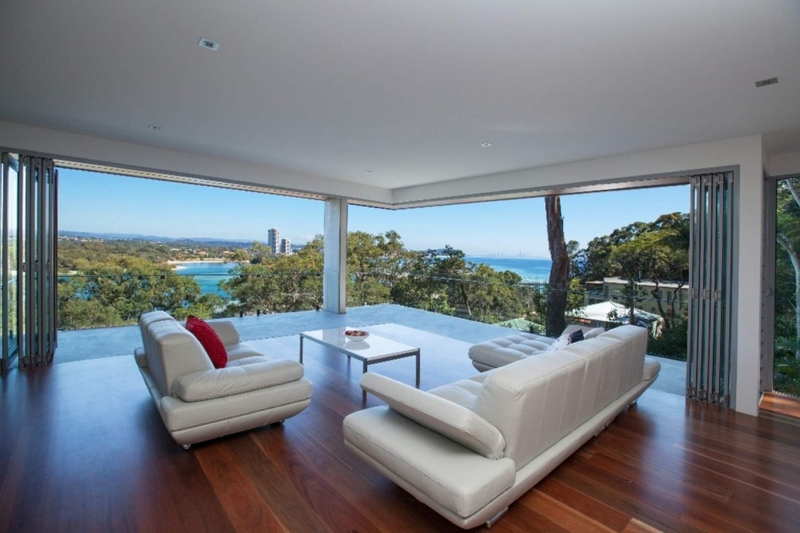 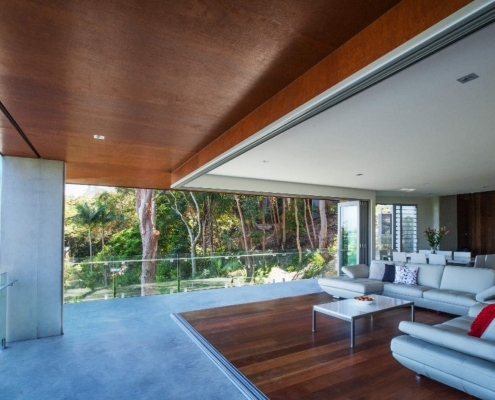 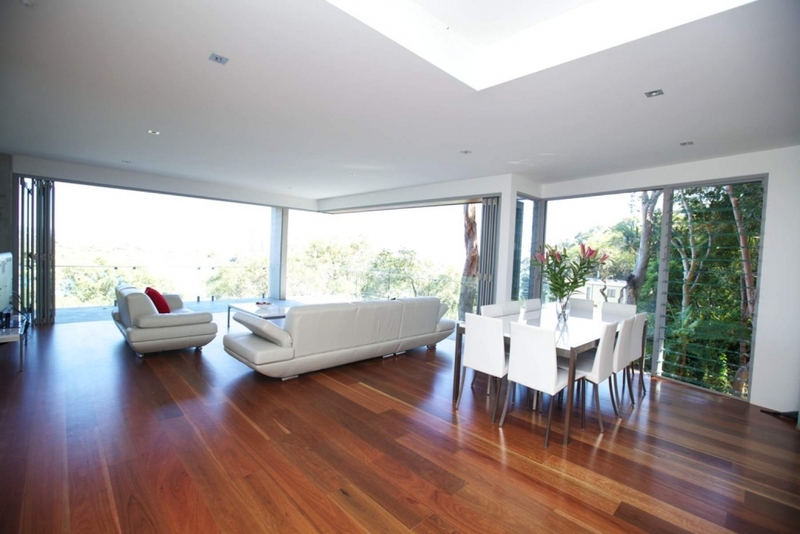 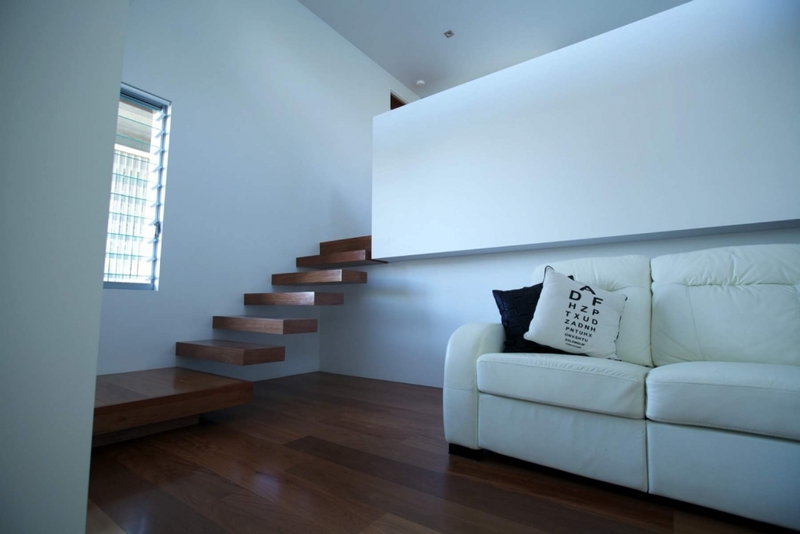 Refined polished timber floors provide a subtle backdrop, and the species varies in different parts of the home. 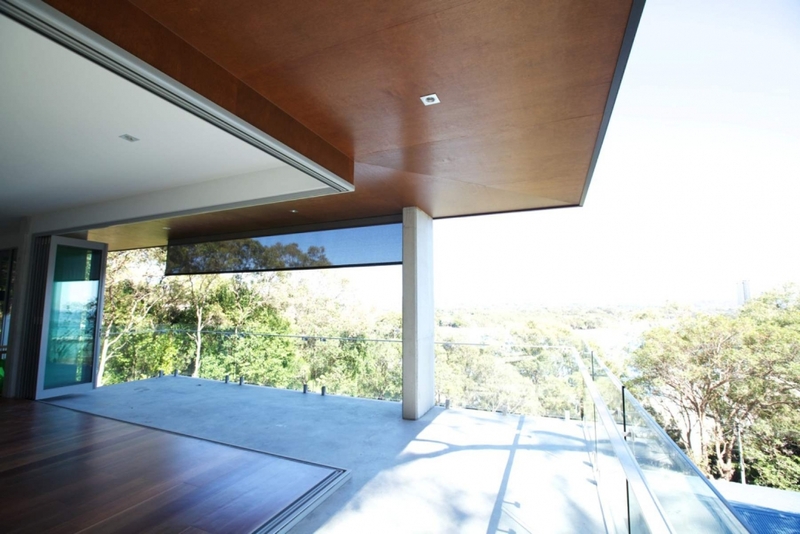 The crafted stone kitchen is located at the back of the room so that one can always be looking out to the view. 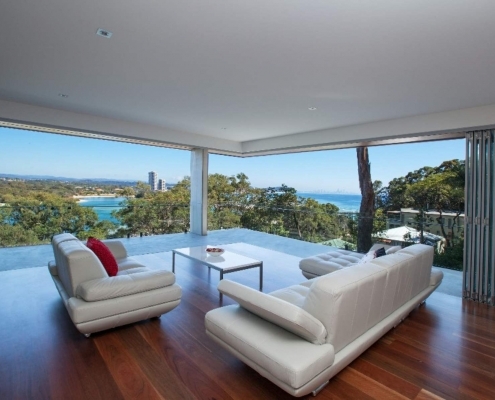 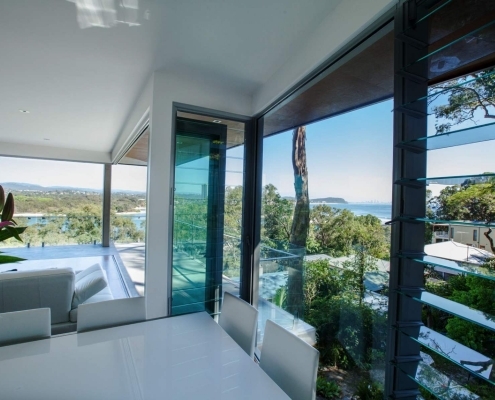 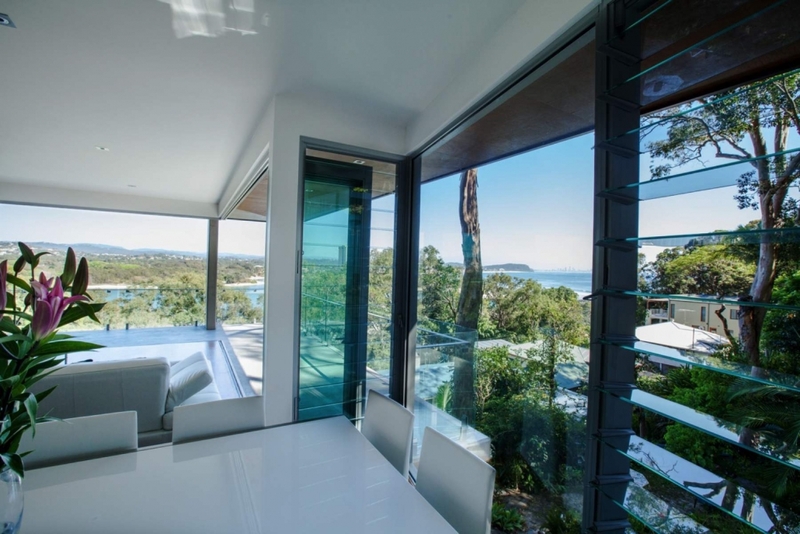 The dining room juts out to the side enabling a different aspect to the usual amazing ocean and river views. 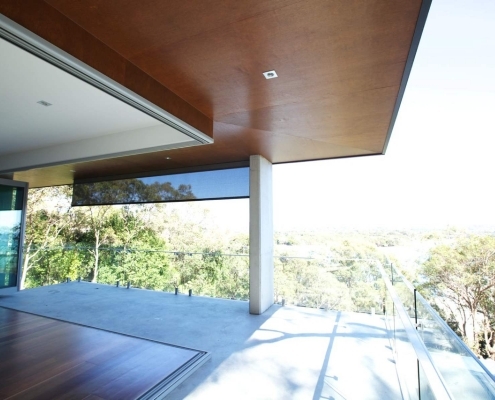 To the south the formal living area looks out over natural bush land through large fixed glass panels and louvres for natural ventilation.